Yesterday we talked about things that people do to make a bad impression so now let’s flip it and talk about all the GOOD things you can do to make an insanely great impression. Having people think highly of us can significantly impact the course of our lives. From our careers, to friends, to partners (in both love in business), other’s thoughts about us really do affect our success in life. While most people will strive to create just the right impression for the moment, there are some things that can skew the perception that people have of you. You may only have a few seconds in the presence of another person to make that first, lasting impression. Body language can be a dead giveaway—it can easily show how you really feel and what you really think. So it is important to be cognizant of how your body reacts in different situations such as when you are nervous or even over-confident. Smirks, eye rolls, and nervous tics can be perceived as disinterest or impatience, even if that is not your intention. Some people talk loudly and appear to come on overly strong at a first meeting. Make sure you practice volume control. Remind yourself to use your inside voice when talking to new people. How you communicate with others can be influenced by the tone you use. If your voice is monotone, you may appear to lack enthusiasm. Monitor your tone, keeping it light and friendly. Nerves can sometimes cause us to look everywhere but at the person we are talking to, which can be perceived as rude. Focus on making eye contact when speaking and when listening to others. A smile goes a long way. If you’re meeting people for the first time, you want to create an impression of being friendly and approachable. If you walk around with a frown or grimace on your face, you may be telling people to keep their distance. People like to be remembered, so make every attempt to remember a person’s name and use it throughout the conversation. Research some easy memory techniques to help you match up names and faces. All too often, basic manners and politeness go by the wayside. If you want people to like you right off the bat, be sure to use common manners like saying ‘please’, ‘thank you’, ‘you are welcome’, ‘nice meeting you’, and ‘excuse me’. Ask people questions about themselves and be sure to actively listen to the answer. People like to know others are interested in their lives and likes. You may like to talk about yourself but don’t yap endlessly. Highlight some of your finer moments, your interests, and thoughts relative to the conversation to keep it going. It’s nice to be proud of your accomplishments but it’s also admirable to acknowledge your weakness. Your ability to use self-deprecating humor when appropriate lets people know you are a human with flaws and that you are able to be honest. Whether you are meeting new friends or interviewing for a new job, it is always wise to be prepared. Review whatever details you can about the company and be prepared for what may come. Remember that any new people you meet are a potential networking opportunity for your career and your personal life, so make the first impression a good one. If you have a pre-arranged meeting time and place, be sure to be there at that time, if not a few minutes early. If you show up late or miss appointments altogether, you can give a first impression of being unreliable and irresponsible. You will give an instant impression just by what you choose to wear. If the situation dictates the need for a professional look make sure you look clean, well-dressed, and appropriate for the occasion. Throughout your lifetime you will likely meet people from all walks of life. It is important to remain open-minded when people do, say, and act differently than you do. Accept these differences and withhold judgments, as not doing so can change your body language and overall demeanor during an in-person meeting. It is one thing to blow through a conversation filled with slang with your friends, but it is important to speak clearly when meeting someone new. How you speak can make people form an immediate impression of you (possibly uneducated or even lazy). Enunciate your words and avoid using slang or inappropriate language. If you meet a person for the very first time and speak negatively about mutual acquaintances or people in your life, you may be giving the impression that you are untrustworthy and disloyal. People will assume (often correctly) that you will talk the same way about them at some point. While you should be attentive to your actions and your words, you shouldn’t hide your true self. If you are a funny person, incorporate some humor in your conversation. If you have specific interests, share them, as they are relevant to the conversation. People will likely be more eager to relate to people that have upbeat personalities. Think about what makes you remember new people you meet. You don’t have to do something outrageous to make yourself stand out, but it is worth the effort to be memorable in some way. This can be especially important for job interviewing opportunities when competition is tough. While a lot of people can be negative by nature, people tend to gravitate towards those with a positive attitude. Not only is positivity in your attitude and speech important, but you should also consider the image you portray on social media pages. 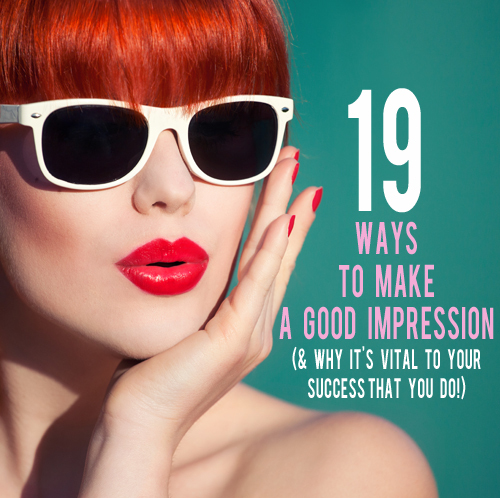 What are some specific ways you’ve made a good first impression? And, if you’ve made a bad impression how do you fix it? The first impression is really important, I hope your guide will help me.